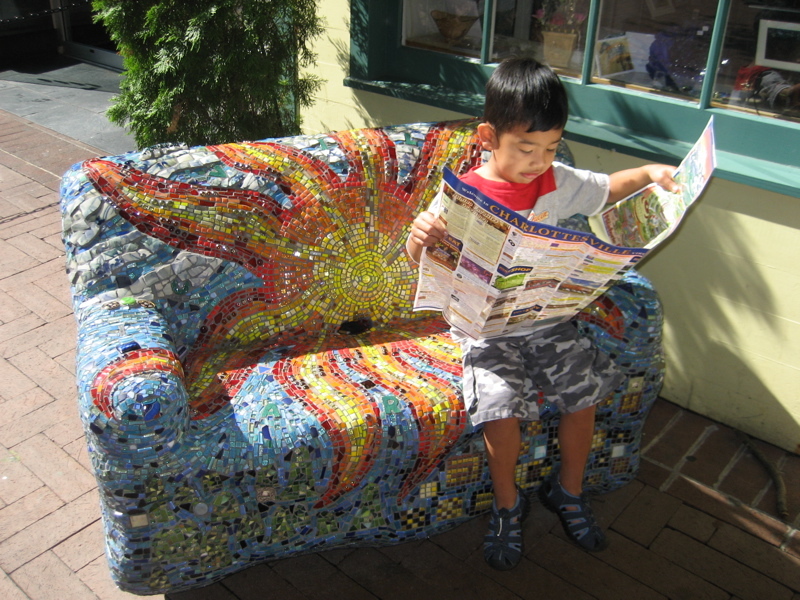 The mosaic love seat in front of Cville Arts. Perhaps the Mall’s best photo op. Created by artist Virginia Gardener in 2007. 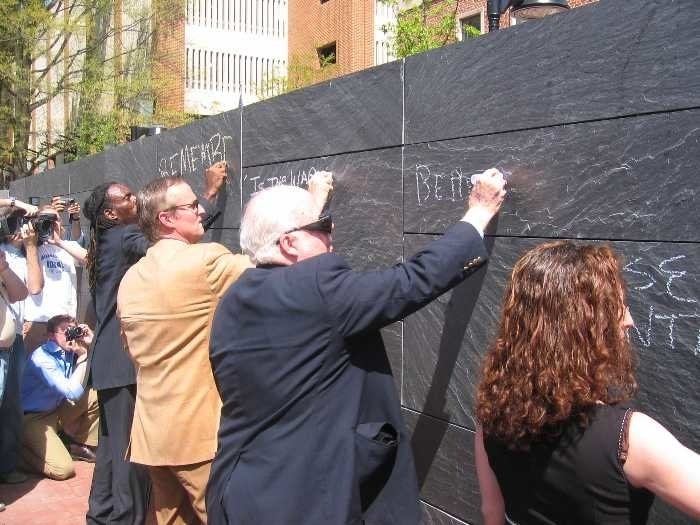 Unveiled in 2006, the officially named Charlottesville’s Community Chalkboard and Podium: a monument to the First Amendment, was a bit controversial when it was proposed, but the 55-foot-long, seven-foot-high slate blackboard has proven to be quite popular. Built with private funds by the Thomas Jefferson Center for the Protection of Free Expression, there’s no telling what you’ll find on the wall, from the profane to the profound. 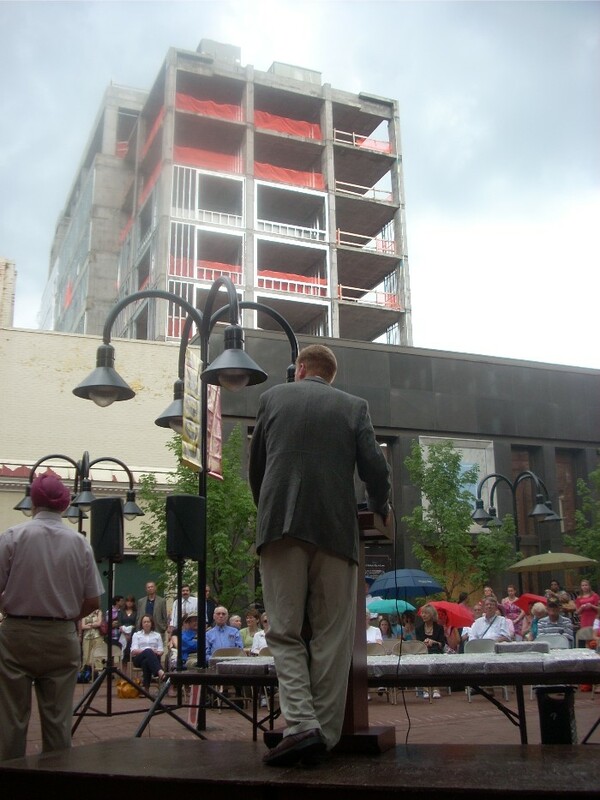 Until someone decides to buy it and finish building it, this hulking 9-story shell of concrete, which has been looming over the mall since construction stopped in 2008, has become an unofficial attraction. The brain-child of internet millionaire Halsey Minor, the Landmark was meant to be a luxury hotel, but financial and legal problem beset him. He filed for filed for Chapter 11 bankruptcy in 2010. 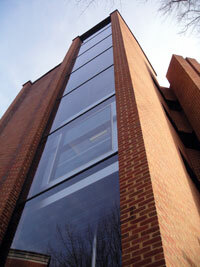 Still, a judged ordered the building to be auctioned off in June 2012, so maybe it will be a hotel after all. It was odd. When the Dave Matthews Band returned to Charlottesville in April 2001 for shows at Scott Stadium, Miller’s on the Downtown Mall suddenly became a tourist attraction. People were outside selling T-shirts and explaining the importance of the restaurant/bar in the history of the band. Indeed, it was while bartending at Miller’s in 1990 that one David John Matthews first heard drummer Carter Beauford, saxophone player Leroi Moore play, and bassist Stephan Lessard play jazz with John D’earth and company. It’s also were Peter Griesar, who joined the band as a keyboardist in 1991 but left the band in 1993, was a bartender. Miller’s was also where Matthews met Ross Hoffman, who encouraged his song writing efforts and represented the band for a time. Today, it’s not uncommon to hear people telling this story as they walk by the restaurant. Any tour of the Downtown art scene begins here. Established in 1975, the Center has three main galleries, and gift shop, and an association of 45 artists working right in the building, which was a former school house. Check it out here. The statue of Robert E. Lee was designed by Henry Schrady, and completed after his death by Leo Lentelli in 1924. In recent years, this park has made a lot of history. Just Google “Lee Park, Charlottesville” to find out more. By the early 1800s, a row of buildings stretched along the west end of Court Square. Among the businesses were merchants selling dry goods and groceries, a hatter, tailor, and a hotel. In a building at the northern end of the row, the town’s first newspaper, the Central Gazette began publication in 1820. The block was torn down to become Jackson Park in 1918. The statue of “Stonewall” Jackson by Charles Keck was erected in 1921. In recent years, this park has made a lot of history. Just Google “Jackson Park, Charlottesville” to find out more. Built in 184 by wealthy merchant John R. Jones, this house is one of the finer ones existing at the time of Jefferson. Recently renovated. This vibrant farmer’s market was established in 1973. Today, over 100 vendors occupy the city parking lot off Water Street every Saturday from April to December, offering produce, cheese, fruits, meats, live plants, coffee, dairy products, baked goods, and many other locally created stuff. Not to be missed. Mission to “honor and preserve the rich heritage and legacy of the African American community of Charlottesville-Albemarle, Virginia. Through inter-generational offerings, the Center will promote a greater appreciation for and understanding of, the contributions of peoples of color locally, nationally, and globally.” Check it out here. Like bird’s eye views? Pop up the elevator of the Market Street Parking Garage, located right on the Mall at 5th Street. Go up to the top deck and enjoy a few of Jefferson’s mountain and the Mall.